Many of the (now-defunct) GOP Establishment’s leading lights boycotted Donald Trump’s coronation in Cleveland. The party’s last presidential nominee, Mitt Romney; former Florida governor Jeb Bush; and Ohio governor John Kasich all made it clear they don’t wish to see Trump in the Oval Office. But all three have suggested that Hillary Clinton poses a similar threat to all that red America holds dear. Which raises the question: Who, exactly, do they intend to vote for this November? By all appearances, Libertarian candidate Gary Johnson is the best choice they’ve got. 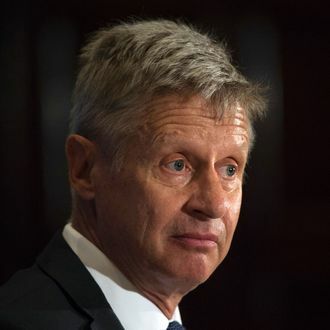 Johnson is basically a garden-variety Republican, except that he doesn’t want to put people in jail for smoking weed or to constantly increase America’s defense spending. Donald Trump, by contrast, is a typical conservative, except he doesn’t believe in free trade, entitlement reform, NATO, the First Amendment, or, quite possibly, democratic government. Johnson and his running mate, former Massachusetts governor Bill Weld, are confident they will prevail in this side-to-side comparison. On Thursday, the Libertarian ticket told CNN’s Wolf Blitzer that they’ve been in discussions with Romney, and that the former GOP nominee may be on the cusp of an endorsement. “He’s thinking about it, Wolf,” Weld said. Earlier this month, Romney said he would probably write in his wife’s name for president, or else pull the lever for a third-party candidate. Last week, Johnson suggested that his campaign has also been in talks with Jeb Bush. While the early 2016 front-runner has yet to give the Libertarian ticket a dose of Jeb-mentum, his younger brother, Marvin Bush, endorsed Johnson on Wednesday. If Jeb and Mitt came out publicly for Johnson, they would amplify the Democrats’ argument that Republicans of good conscience cannot responsibly vote for Trump. However, at present, it appears that Johnson’s presence in the race may actually be helping the GOP nominee. In polls where Johnson’s name is offered, a small but not insignificant number of Bernie Sanders supporters switch their votes from Clinton to the guy who wants to abolish Social Security. To make it to the general-election debate stage, Johnson will need to poll at 15 percent in five national polls. At present, the RealClearPolitics polling average shows Johnson with 8.6 percent support.